Week 11- Word Processing - What is it? Week 35 - Power Point - WHO PAYS FOR THE INTERNET? A switch is a device which completes or breaks an electrical circuit. same thing that regular switches do but doing it in an entirely different way. becomes conductive (able to allow electricity through) when electricity passes through it. sand. It’s conductivity can be changed. It can be EITHER conductive or non-conductive. understand that transistors are very important components of a computer system. immensely more powerful and less expensive than Eniac. 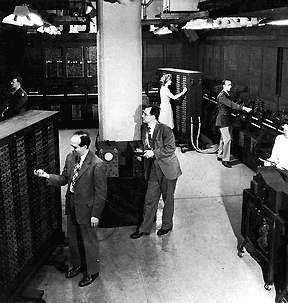 The history of modern computers started with vaccuum tubes. They were large, hot, fragile, and 'burned out' within a short time. Then came the transistor--small, fast, durable. Finally, the CHIP--which handles thousands of signals in milliseconds. Today's computers use a combination of small transistors and Chips.